Sometimes in the middle of the night I’ll sneak out of bed into the darkened kitchen, open up the fridge and stand in the light of the refrigerator while I contemplate snacks to sate my hunger. Cheese has always got my back – its versatility is second to none. For a treat, I’ll melt it between two golden brown buttered crispy pieces of bread. If I want to make it even more indulgent, I’ll add sweet juicy tomatoes and fresh basil to bring the whole thing over the top. 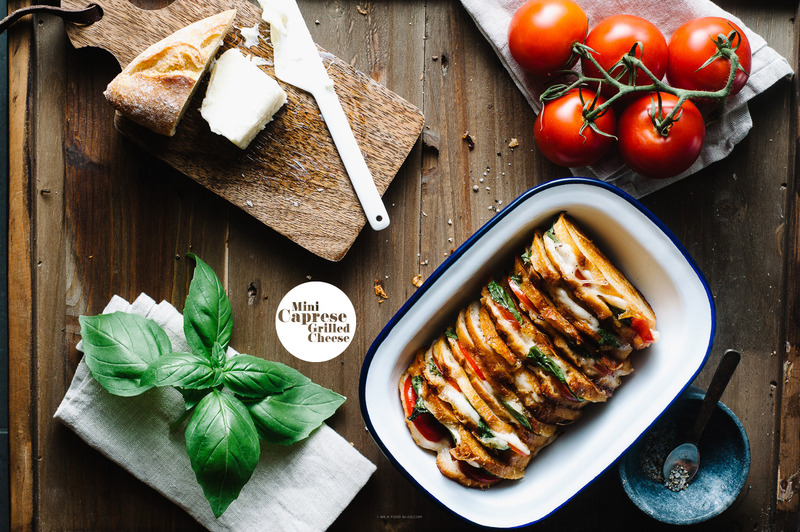 A caprese grilled cheese is always a good thing in my books. 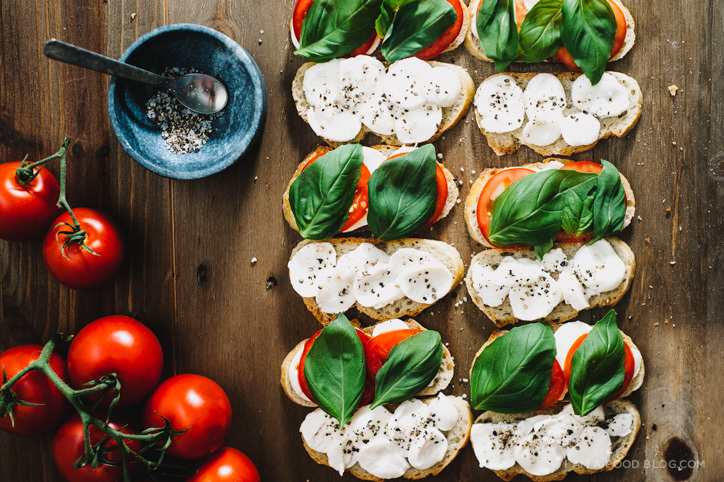 The simplicity of a good caprese salad is a thing of beauty on its own – who doesn’t love perfectly ruby red vine-ripened tomatoes, fresh creamy Canadian mozzarella, and fragrant basil? Taking the ingredients and tucking them into a grilled cheese is, dare I say, even better? The mozzarella melts into a creamy, gooey mess. 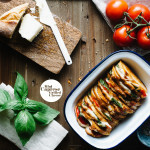 A bit of heat causes the tomatoes release even more of their sweet juiciness and the basil flavor becomes even more prominent when next to crunchy, golden brown toast. 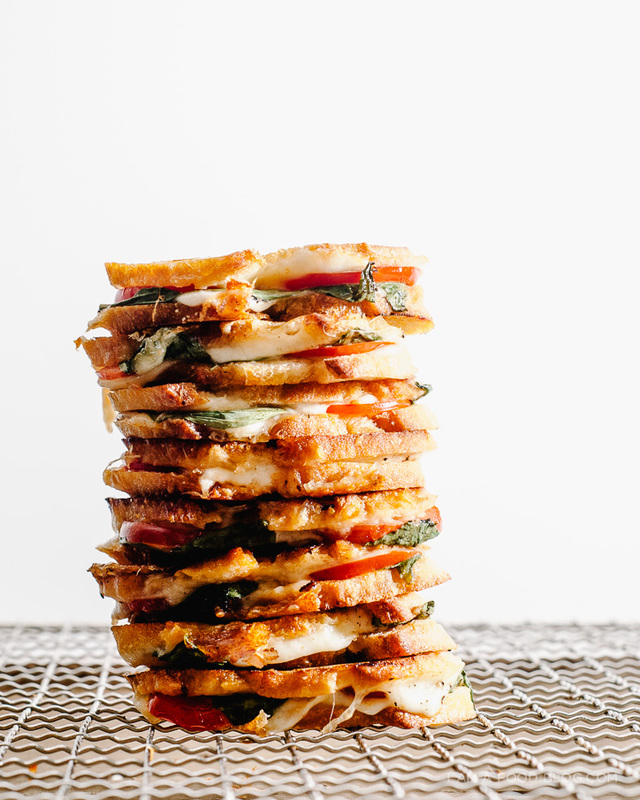 I make these caprese grilled cheeses a lot – as midnight snacks, as a stand in for dinner, or as hors d’oeuvres at cocktail parties. This recipe is infinitely scalable – if you want to make one sandwich, you can definitely do so – but you may be wishing you went ahead and made the whole baguette. With a sharp knife, cut the baguette into thin slices, about 1/8″ thick. Cut the bocconcini into rounds and the tomatoes into thin slices. Wash and throughly dry the basil leaves. Assemble your sandwiches. 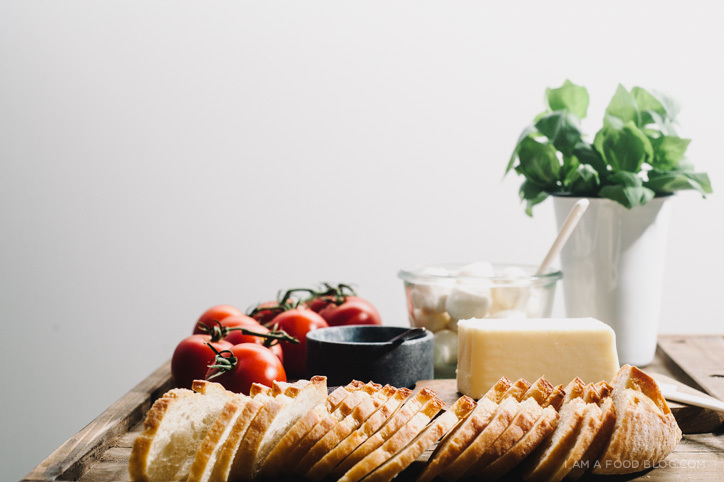 Lay out the slices of bread and place a layer of bocconcini rounds on each slice. Season with salt and pepper and then top alternating slices with tomatoes and basil leaves. Close up the sandwiches and butter the outsides of the bread. Heat up a cast iron or non-stick pan over medium to medium-low heat. Toast the sandwiches, flipping once, until the cheese melts and the bread is golden brown and crispy, about 3-5 minutes per side. Enjoy immediately! PS – Look for the 100% Canadian Milk symbol whenever you buy cheese, it confirms the Canadian origin of the milk, renowned for its high quality, purity and great taste! So good. Sometimes the most amazing things are the simplest! Grilled caprese sandos? Genius! And gorgeous as always. I’m making this tonight! I have one little pile of tomatoes left from my farmers market trip this weekend. These sandwiches will be perfect!! these are so gorgeous. and go canadian dairy! yummmm. this is gorgeous, steph!!! Amazing. Grilled cheese never disappoints! Wow, now this is the way to my heart. Simple enough, but flavorful ingredients to make a mouthwatering, easy meal. Perfection. These are so cute and YUMM! 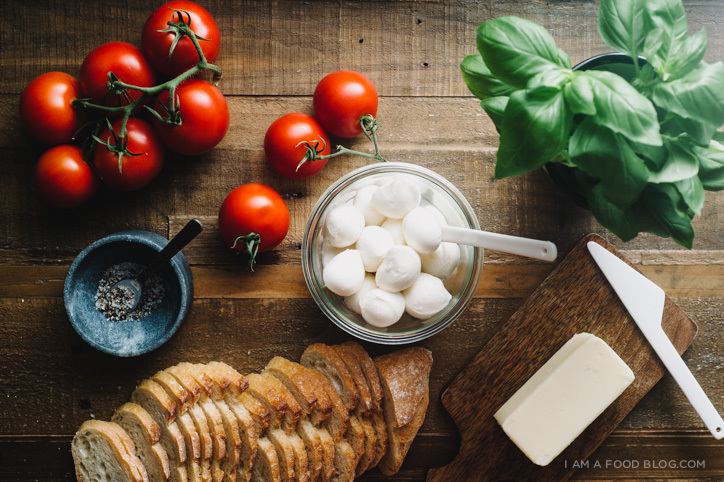 love this – nothing beats caprese! caprese sandwiches used to be like THE favorite sandwich of mine! and i think buttering up the outsides of the bread, and frying it up in a skillet is so baller; it also makes me wonder why i had never tried this before when i ate cheese! you’re awesome, lady! Oh my goodness. I need this! They look so beyond delicious, and they are mini. Too cute. Too perfect. Pinned! Your description of highly trips to the fridge reminds me of 1. myself (guilty as charged) and 2. Nigella (I bet you have seen those episodes?). Also: your caprese grilled cheese looks simply brilliant. Thank you for sharing an idea that actually manages to make grilled cheese classy! Grilled cheese is my little guilty pleasure. It’s so yummy but I always feel like a lazy chef when I make it. These look outstanding. Cheese grilled sandwich is yumm and cool pics! Wow, this sandwich looks gorgeous. I am sure it tastes heavenly. Yummy! Sharing this right away. Looks delicious.